I had people ‘try’ to help me out by giving me advice… oh there should be a book on what NOT to say to someone who is desperately trying to conceive.. sigh. I know they meant well, but Oh my goodness, no, just NO! But, after lots of prayers and trying different ways, we finally conceived our third baby! It was the month we took off…. seriously, it was… GO FIGURE! So, with my hardships on trying to conceive, I really wanted to give back to those of you that are having a hard time trying to conceive or are just wanted to get pregnant and have not really tried yet. So, I am offering a great giveaway to you!!! Me and Fair Haven Health thought it would be great to offer one lucky person who is ttc a 3 Month Supply of FertilAid for women AND a 3 Month Supply of FertilAid for their man!!!! That is a $150 Value! Woot! With an all natural, non-prescription, patented formula* that brings together scientifically-validated herbal ingredients and essential vitamins, FertilAid promotes female hormonal balance and reproductive wellness, supporting fertility and optimizing your chances to conceive. 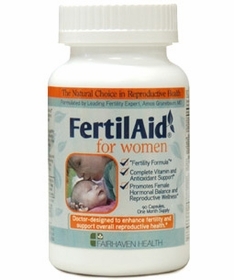 Created by ObGyn and leading fertility expert, Amos Grunebaum, MD, FertilAid for Women combines fertility-enhancing nutrients with a “Just Right” formula of folic acid, essential vitamins and minerals, and key antioxidants. This comprehensive formula makes it the only fertility supplement offering total preconception vitamin support – optimized for trying-to-conceive women. FertilAid has no negative side effects and has no impact on multiple births. 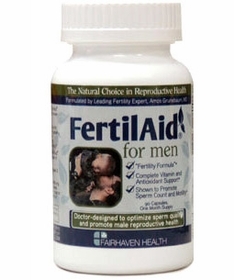 Formulated by Amos Grunebaum, MD, the ingredients in FertilAid for Men have been scientifically demonstrated to enhance male fertility and improve overall reproductive wellness as part of a healthy diet and lifestyle. Ideal for men with a low sperm count or for those looking to optimize their sexual health. My friend has been trying to conceive for several months. It took 3 years to conceive my son and we have been trying for another one for about 2 years now. We’ve been trying for six months. It took almost two years for my last little one. Would love to win I think a baby would bring my family closer. We have been trying for almost 2 years. We have been trying to concieve for 5 yrs. I have pcos. Thank you! My husband and I have been ttc for 5 years. No pregnancies. Thank you so much for giving others an opportunity, it is very wonderful of you!! We have been trying to conceive for 5 years, suffered a early miscarriage in 2010 and almost a year ago suffered a stillbirth at 6 months. We want more than anything to be able to conceive. shared and liked on FB! would love to win this. been TTC going on 4 years. I have severe pcos and nothing has worked so far. thanks for the giveaway and good luck to all who entered! We’ve been trying to conceive for 8 months. I’m 38 so the clock is ticking. Been trying to conceive for over 4 years. We’ve been trying for our first for 2 years. ttc for 2 years I have pcos my dh has low sperm count this would help so much thank you for doing this and hopefully one lucky couple gets a BFP thanks to you baby dust to all. I really hope I win!!! Could really use this!!!! My first little one passed away after birth and been trying to conceive for 2 years and no luck. Me and my husband have been TTC for about four years. It’s been really hard and I thought after my WLS it would be easier, but it hasn’t. I’ll be 45 years old in March and this maybe my last attempt to be a mother. But age plays a factor before it was my age and weight! My husband is overweight and I told him that when a man is overweight as well as a woman his fertility is effected just like hers. He had a sperm analysis a few years ago and it’s just tittering on the border of being low, so we need some help. I really need these products! Thanks. What an amazing gift this is!!! My husband and I are new to TTC in regards to many others on here, but I would love to win this! 7yrs the first time around and 3 yrs the second time. My husband and I have been trying for four years. It’s also my birthday this month! This would make a great gift! We’ve been trying for about 3 years for our first. What an amazing give away! My husband and I have been TTC for baby #1 for 2.5 years now. It is everything you said… “SO hard and draining, sad, crazy, depressing” and I am a mess! Every month it’s always something. Either I don’t ovulate, and if I do and time BD just right AND use PreSeed the tests are always negative and here comes AF. We are currently moving back home to FL so I told my husband that once we get settled in that we are giving FertilAid a try. This would be perfect!!! My husband and I have been trying to conceive for well over a year, pcos is a pain in the rear! I would love to give FertilAid a go. Thank you for doing this give a way! Been wanting to purchase products from Fairhaven, but are currently living on a tight budget. Been trying to conceive for 8 years. After 9 yrs of marriage, 2 miscarriages and an ectopic pregnancy, I’d love to see if this works for us. Thank you for the opportunity! We’ve been trying for a baby for three years! My and my husband have been together for 9 years! We have been married for 4 years! I have a 10 1/2 year old son! We have been trying to get pregnant for 4 years. I have has 3 IUI and spent lots of money cause I was told I has PCOS about 7 years ago! Just this year I was told the only way I would ever have a chance to become pregnant is invitro. In the last 6 months I have lost 60lbs so it would help me a little. My husband and I would love to win this it would change our life’s. we are going to try furtilaid! We have been TTC for 15 months…. I hope that I win!!! I have been trying to conceive for 2 years. I’d like to win I really think that these products will help my husband and I. Thanks for holding this giveaway! We’ve been trying for 3 years now. We’ve been trying to conceive for over 2 1/2 years- using only natural/organic products so far. Hubby and I have been TTC for 8 years with no success. We have a beautiful 3 year old daughter we adopted when she was born and I’m so thankful to God for her! I would still love to chance to experience pregnancy. I stopped having menstrual cycles when I was 13 (14 years ago) and I’ve been put on Clomid, Provera, etc and nothing has helped me start. Would love to give FertilAid a shot! Thanks! Been trying to conceive for almost five years. This would be amazing! We have been trying to conceive for seven years! Nothing has worked so far, but we are going to be trying the fertilaid products!